NEMO Escape Pod 1P Bivy. Unique NEMO AST® airbeam, or inflatable rib, weighs hardly anything and packs smaller than traditional poles for the perfect bikepacking solution. Combine Escape Pod™ bivy, Moonwalk™, and Apollo™ shelter for the ultimate bikepacking kit. 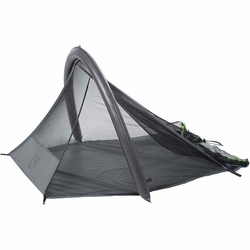 Two-thirds length bivy with drawstring closure provides bug protection where you need it, without wasting an ounce of weight. Packs incredibly small, into roughly the size of a Florida™ grapefruit. Works independently as a bug bivy, or as a system with our Apollo™ 3P tent and Moonwalk™ sleeping bag.